For the 2009-10 longlist see the Links page. Websites related to authors on the 2007-2008 longlist. Links will open in the current browser window. To return to this list, use the Back button. Doncaster Book Award is not responsible for the content of external links. The DBA committee have adopted Neurofibromatosis as their charity and held a sponsored walk in memory of Cecilia Hooley earlier this year. We plan to make this walk an annual event to raise funds for this charity and its sister charity epilepsy. 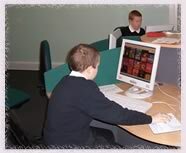 In 2004, an event was held at Doncaster North City Learning Centre where pupil representatives from several schools got together to pool their ideas on what they wanted from a website. The culmination of their ideas and designs that they put together using Dreamweaver was the first version of this site, brought together by CLC staff on the pupils' behalf. The day was a great success and everyone had a really good time. In 2005 a searchable reviews database was added and the site was given a makeover for the second year of the award. This work was carried out by Intexta Web Services, working closely with Lyn Hopson of Don Valley School & Performing Arts College. As far as possible the pupils' original ideas from the brainstorming session were retained.